Actually amazing, but virtually all Traditionalistic books are anthologies of some sort. Books of specific authors are often collections of essays earlier published elsewhere and there are many books such as the present title in which texts of different authors are brought together. Judging the title, this book is intended to be an introduction to Traditionalism. 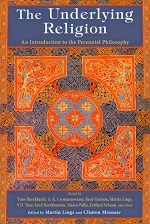 The complete title goes The Underlying Religion: An Introduction to the Perennial Philosophy. The book is divided in a couple of subjects. The first group is titled “Tradition and modernity” and consists of three essays of Lord Northbourne. Then follows “Traditional cosmology and modern science” with texts of Martin Lings, Titus Burckhardt and Philip Sherrard. The next three essays are about “Metaphysics” are are from the hands of René Guénon, Martin Lings and Seyyed Hossein Nasr. Lings, Ghazi bin Muhammad and René Guénon form the trinity about “Symbolism”. Lings, Ananda Coomaraswamy and William Stoddart have texts in the part about “Mysticism”. Frithjof Schuon, Titus Burckhardt and Marco Pallis have texts headed with “Beauty”. The last three texts are about “Virtue and Prayer” and are of Tage Lindbom, Reza Shah-Kazemi (about Schuon) and Titus Burckhardt. Indeed, a variety of texts and (up to a certain degree) a variety in authors, old and and more recent and well-known and lesser known. The book certainly contains a few classic texts which are also valuable to people who are well acquainted with Traditionalistic thinking. For people to whom all this is new, The Underlying might act as a good, but not too easy, introduction.